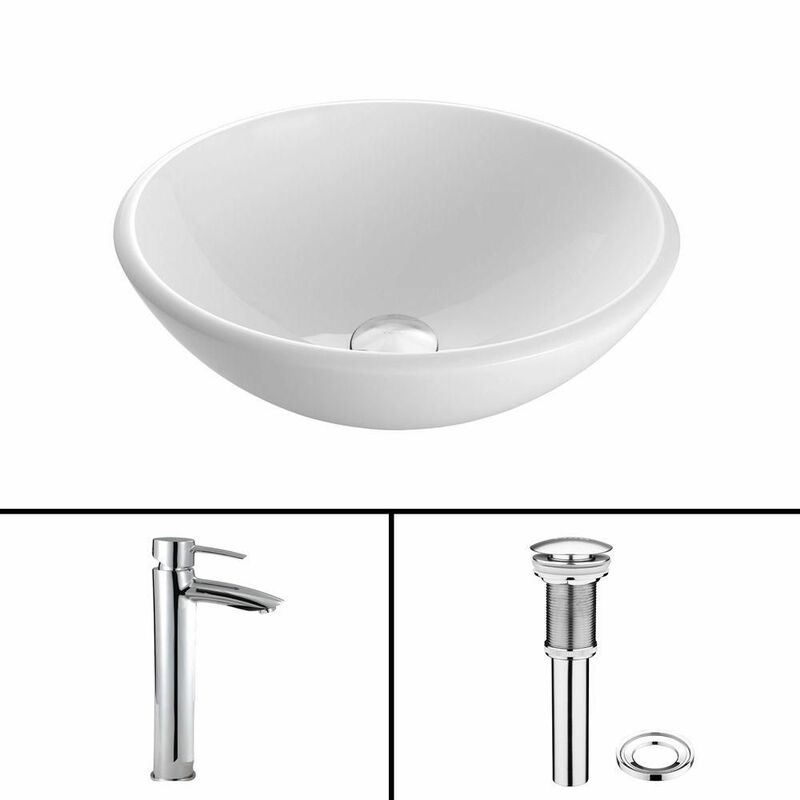 Stone Vessel Sink in White Phoenix with Shadow Faucet in Chrome is rated 4.5 out of 5 by 6. Rated 4 out of 5 by DrStork from Take care in installation Parts are all heavy, with a substantial feel. Installation instructions are basically a couple pictographs. First time I have installed a drain where the bottom gasket and ring are secured to bottom of granite instead of the bowl itself. One bowl sealed just fine. I suspect I deformed the top seal (a rubber ring instead of silicone or plumber's putty) by turning the bowl a bit after tightening. So, trying again with plumber's putty. Rated 5 out of 5 by renovatingramma from Vessel sink Exactly what I was looking to use on an old dresser converted to a vanity. Very charming! Have not installed yet as we are still remodeling bath, but it will definitely be the focal point!! Delivery was quick, packaging was great and the price is unbeatable considering the price of faucets for these sinks! Rated 5 out of 5 by Condor from Beautiful addition to our new bathroom. This online product came very well packed and in a timely manner. Easy to install with easy to understand instructions. The quality is superb. I would highly recommend to anyone who wants a stylish powder room. Rated 5 out of 5 by David from Almost Had To Return It Very nice quality sink, faucet and drain. I almost had a problem installing the drain because of the length of the threaded portion that goes through the top of my vanity. After inserting into the sink, the drain needed to go through the chrome stand for about 1/4 inch, then tile, then 1/4 hardiboard, then 3/4 plywood. There was just barely enough thread left to screw on the tailpiece. The faucet was not a problem - it had a couple inches more thread. Rated 4 out of 5 by Anonymous from Great value!! Everything needed to install sink & fawcett. Impressive quality, extraordinary value, nice going HD!!! Shipped on time and received in perfect condition. I installed in recently built out basement bathroom, but it looks suitable for a Mansion master bath. Rated 4 out of 5 by Cardplay from Nice product The product itself is worth 5 stars, but the installation instructions were poor and misleading. I've written installation instructions for complex aircraft and ship mounted systems so I have some familiarity with what's required. The instructions were not only confusing but outright wrong.